This is a concise, up-to-date reference on anesthesia for urological surgery. Urological anesthesia is not recognized as a specialty, and a majority of anesthesiologists and nurse anesthetists will provide anesthesia for these patients. Advances in urological procedures, the advent of treatment of patients with strong anticoagulant and antiplatelet medications, and the demographics of urology patients (many of whom are young or elderly) present challenges for the anesthesiologist and have necessitated changes in anesthesia practice. The last volume on this topic was published in 2000, and the time is right for a fresh presentation of contemporary expertise in anesthesia for urological surgery. The book provides a brief review of renal physiology and pharmacology then addresses anesthesia for each major group of urological procedures (e.g., endoscopic, office-based, laparoscopic and robotic, nephrolithotripsy, renal transplantation, etc.) and in special populations, including the geriatric patient, the pediatric patient, and the pregnant patient. Separate chapters discuss the unique challenges of positioning the patient, and of managing the patient taking anticoagulant and antiplatelet medication, and the chapter on pain management addresses common and important perioperative concerns. This is an up-to-date clinical reference on anesthesia for urological surgery. Advances in urological procedures, the advent of treatment of patients with strong anticoagulant and antiplatelet medications, and the demographics of urology patients (many of whom are young or elderly) present challenges for the anesthesiologist and have necessitated changes in anesthesia practice. 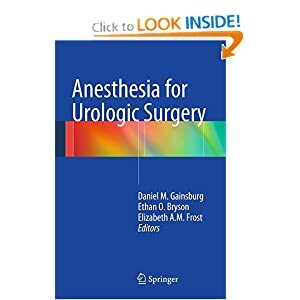 Urological anesthesia is not recognized as a subspecialty, and this book, which reflects the expertise of clinicians and researchers from around the United States and Europe, is written for the majority of anesthesiologists and nurse anesthetists who will provide anesthesia for these patients.